History doesn’t usually get a second chance, especially in a city like Tokyo where heritage often has a timeline as stunted as a bonsai. Even the grandest names aren’t impervious to the wrecker’s ball and Frank Lloyd Wright, surely one of the world’s most celebrated architects, is no exception. Wright, a passionate collector of ukiyo-e woodblock prints, had long sought out inspiration from Japan; the “floating world” of the ukiyo-e, with its philosophy of evanescence and fleeting beauty, struck an ethereal chord in the architect. He spent seven years in Tokyo from 1917 designing and building his Imperial Hotel. Although Wright was also responsible for some 14 other Japanese projects, the Imperial was a legacy that would crown his career. Opened on 1 September 1923, the Imperial survived a massive earthquake that struck on the very same day as well as Allied bombing during World War II. It was a magnificent building but time became its most potent enemy. In 1968, it was demolished to make way for a modern, high-rise building. That would have been the end of the story but Wright’s Imperial Hotel, or at least the front section, is not lost to the world. 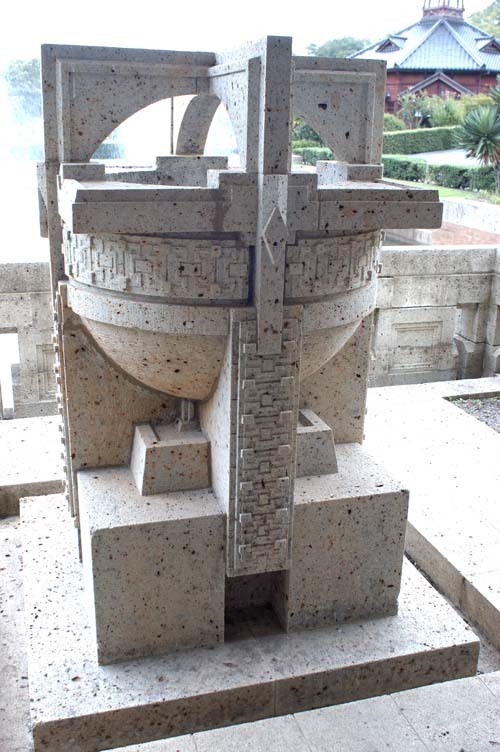 It can be found in a rather unlikely setting, in a theme park of architectural history outside Nagoya. Museum Meiji-Mura is not easy to get to from Tokyo. Two hours in a Shinkansen to Nagoya is followed by a half-hour journey to Inuyama. A 20-minute bus ride brings visitors to the park which holds almost 70 buildings of the Meiji era (1868-1912), gathered from across Japan and overseas and arranged in a jumbled harmony along the western shores of Lake Iruka. There’s an other-worldly quality to Meiji-Mura; the pristine setting and the fastidious attention to maintaining detail and atmosphere is like a Japanese version of The Truman Show. Exploring the park can take all day so arrive as early as possible. There’s the elegant wooden Uji-yamada Post Office, fashioned like an English seaside pavilion. St John’s Church, built in 1907 in Kyoto combines Romanesque and Gothic characteristics on the lower levels and an almost Orthodox Russian confection above. 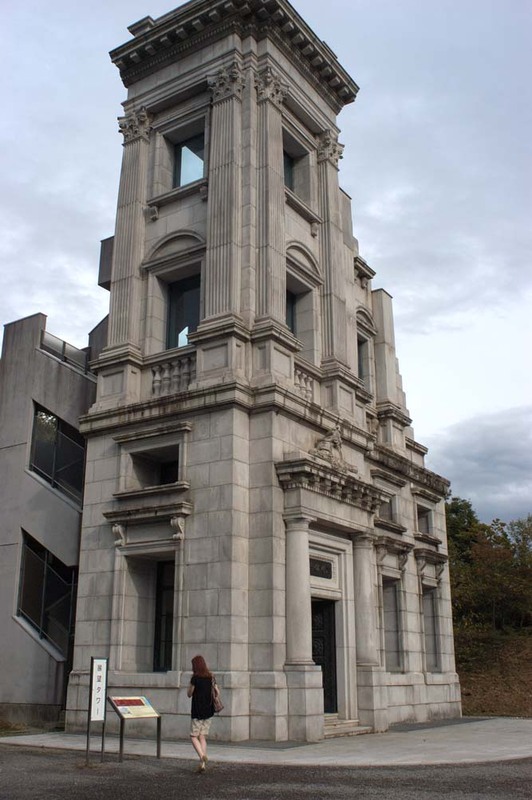 A westerner’s house from Kobe, built in 1887, is a mannered two-storey structure with enveloping colonnades, while the fragment of the head office of the Kawasaki Bank in Tokyo, built in 1927, shows an imposing yet finely-detailed European Renaissance style. The highlight for Wright fans, however, is the main entrance hall and lobby of the Imperial Hotel. The expansive space, which harmonises on a characteristically human scale, is a delight for lovers of fine architecture. In a tea shop above the foyer, visitors sip a delicate tea infused with yuzu, a small tart citrus fruit, while marvelling at Wright’s visionary ideals. Elsewhere in the park, there’s much to divert attention. The traditionally-styled 1870-era Nakai Sake Brewer from Kyoto invites sake tastings. The wooden Kureha-za Theatre, transported from Osaka and dating from 1868, has kabuki entertainment while the Shinagawa Glass Factory, constructed in 1877 and seemingly snatched from a British architectural pattern book, sells finely-crafted blown glass items. 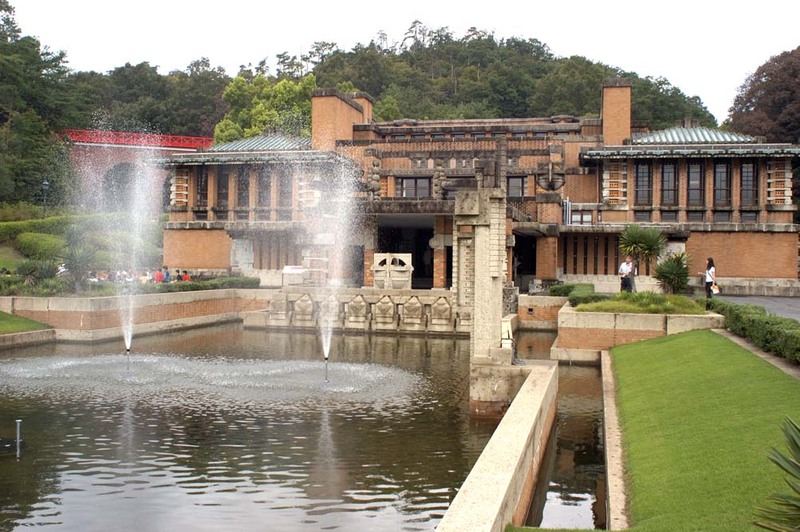 While it may seem bizarre to find as important a work as the Imperial Hotel in such a setting, it’s worth reflecting that Frank Lloyd Wright in a theme park is infinitely preferable to no Frank Lloyd Wright at all. Is that your haiku? Beautiful, but what is the ‘glass horse’ reference? Tantalising as the unicorn in Bladerunner.